Delayed harvest was common and slow dry-down resulted in even more delays. But what was the impact of the late season rain on quality? Throughout much of the U.S. corn growing region, 2017 was best characterized as a mixed bag. Conditions in the spring allowed for early planting and some regions of the country had ideal rain, while large portions of the country experienced near drought conditions. Then, when harvest was ready to begin, the rains began. Delayed harvest was common and slow dry-down resulted in even more delays. Despite all these challenges, corn growers produced more than 14.5 billion bushels of corn. But what was the impact of the late season rain on quality? Kemin Customer Laboratory Services (CLS) analyzes corn from all over the U.S. Valuable information is gained from the samples submitted and is summarized in the report below. Corn harvested in 2017 had moderate levels of mold at harvest. The samples received at Kemin CLS contained higher levels of mold over time (Figure 1). The graph shows the results of samples received from October 3, 2017, until December 11, 2017. Of the 77 corn samples evaluated for mold count since harvest, 9% showed mold levels above 1 million colony forming units per gram (CFU/gram). Dairyland Labs recommends producers discount energy by 5% for mold levels over 1 million CFU/g (https://www.dairylandlabs.net/molds-and-mycotoxins/mold-interpretation). Note that 30% of corn samples have between 100,000-1,000,000 CFU/g. Even these mold levels can impact animal performance and mold counts can increase as quality suffers during storage. Figure 1. Colony forming units (CFU) of mold found on corn samples submitted to Kemin CLS. Not all samples submitted to Kemin CLS for mold evaluation are subjected to an evaluation of the species of mold–it is the preference of some customers to only seek a mold count, not a full species evaluation. Of the 77 samples submitted for mold evaluation, Kemin evaluated 73 corn samples for the species of mold. Since harvest, the most common mold found was Fusarium spp. More than one mold species was found in 44% of the corn samples submitted and 63% of the corn samples submitted had Fusarium mold. Fusarium mold is classified as a “field mold” because it requires available water to multiply. It will often appear white to pink in color. However, just because it is a field mold does not mean it will not grow in storage. The second most common mold species and was found in 45% of the corn samples submitted was Penicillium spp. This is a storage mold and will often appear gray or greenish in color. Lastly, the third most common mold was Trichoderma spp. and was found in 19% of the corn samples submitted to Kemin CLS. 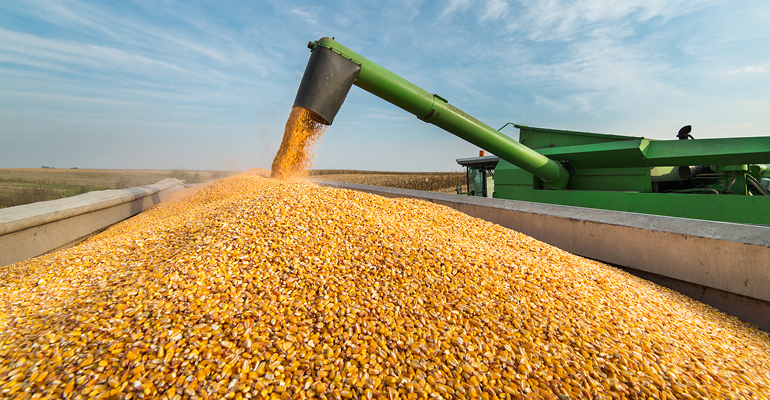 Test corn for mold and mycotoxins – storage conditions greatly impact grain quality. With mold levels near threshold levels, which can impact performance of the 2017 corn supply, use Myco CURB® Dry at 2lbs/ton or Myco CURB® Liquid at 2lbs/ton to control mold growth in stored grain or complete feed. 1. Data from Kemin CLS corn samples submitted as part of an annual monitoring program. 2. Bartov, I., N. Paster, and N. Lisher. 1982. Poultry Science. 61:2247-2254. 3. Kao, C., and R. J. Robinson. 1972. J. Food Sci. 37:261. 4. www.extension.psu.edu. Accessed on Dec. 28, 2017.